The human as a biosocial being actively interacts with both the environment and other individuals. While individual can interact with nature only through physical contact or indirectly through material objects, with people he/she can use a special, unique way – communication. 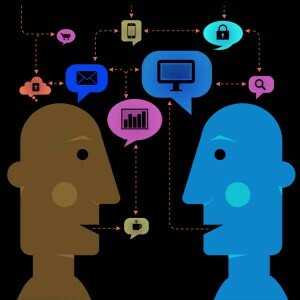 Communication is the process of establishment and development of contacts between people and groups, provided by the needs of joint activities. It includes three main components: communication (information exchange), interaction (activities exchange) and social perception (perception and understanding of the partner). The language both oral and written is used as a communication tool. Non-verbal communication implemented through facial expressions, gestures, voice, posture, etc. is used as well. The role of communication in human development cannot be overestimated. There are many examples of deprivation of human communication led to catastrophic consequences. This also includes children with mowgli syndrome raised by animals and who are not capable of social life. As well as deaf-blind and mute children whose thinking is much behind of healthy peers’ thinking, etc. With the help of communication people solve a lot of problems, such as information and experience exchange, they organize joint activities, get to know each other and the world, affect each other, express thoughts, ideas and emotions, meet the requirements and much more. Communication helps not only to solve practical problems, but also affects the internal state of the individual, his/her temper, emotions and personality. Some situations can cause emotions, both positive (delight) and negative (rage). All this has a significant impact on the human psyche, leaving deep “marks”. They can influence personal qualities and decisions, not only at the time of communication but also in the distant future. In fact the word as well as an action may benefit and also may cause irreparable harm. Overall, right and positive communication with a child since the birth is very important for self-improvement of every person. Then he/she grows into a successful and valuable personality who is able to improve the world we live in. Objective and manipulative activity is the leading activity for children 1-3 years of age. He/she begins to explore the world through active engagement with all sorts of objects that surround him/her. On the basis of trial and error he/she tries to understand the point of each item, its purpose and what can be done with its help. In this situation, communication becomes more informative and educational. Adults can show how to deal with the things, how they can be modified, carried and operated safely. The child receives the first experience of mediated interaction with the world, explores methods and consequences of various items. Now oral speech that is quite clearly understood emerges in child and he/she is able to communicate with the help of language, express his/her thoughts and desires. And he/she requires active practice for language development, and adults must help with it. One need to provoke him/her to talk, listen to him/her carefully, ask questions, clearly and completely answer his/her questions, tell him/her short stories, give little guidance and instructions. Child’s communication is of contextual and business character. It satisfies the need for cooperation with adults that is directly related to the objective activity, has a business motive and uses verbal means (language). Communication in this age also can be both of positive and negative character. Thus, communication is a very important tool of development and socialization. Proper communication with the child since the birth will create conditions for the improvement of all the qualities that adults need to become successful, harmonious, free and happy. Precisely such a person can create valuable results, true masterpieces that will benefit mankind. The main tool for communication development is a mechanism of advanced initiative of the adult. It is the adults who have to enrich the content of child’s activity and interaction, create a zone of personal development by setting the objectives and implementation of joint activities with adults. In general we can say that communication with the child should be positive, constructive and developmental. And you need to make sure that the child also communicates friendly and actively, takes interest in others, asks questions, answers them and expands his/her vocabulary. Then many goals he/she can achieve much more easily than people for whom communication is difficult. Therefore, first of all it is important for parents to prepare for proper communication with their children, learn to control their emotions, use effective upbringing and educational skills. Neither friends nor other adults or school are able to impact on human at an early age but the family. And it depends on parental behaviour how successful, valuable and happy their favourite child will be in future. So from the early age positive communication is essential for self-improvement of every individual. And that is parents who should play the leading role in this process. After all, the way they bring up and teach their child he/she will continue to apply his/her knowledge when communicating with others and will be interesting for other people. This entry was posted in Mental, Social on 28/03/2016 by Mary.